Outdoor herb gardens are my favorite type of garden. There is something really satisfying about plants that do it all – they are pretty, fragrant, tasty and even medicinal! They can be grown in a formal style, or rock an old boot! Herbs are practical plants full of nostalgia and charm, and can grace the finest table while tantalizing virtually all the senses. And they have a quality about them they makes you want to bake from scratch, buy organic and pour good wine. But rather than just bring you pretty photos of great English herb gardens (ok, there are a few of those here, I confess…) we have some creative outdoor herb gardens and herb garden planter projects to make you an herb convert! Our first project is from ‘Ginger Snap Crafts‘. This DIY herb garden project takes a little bit of handy work with tools but we just love it! 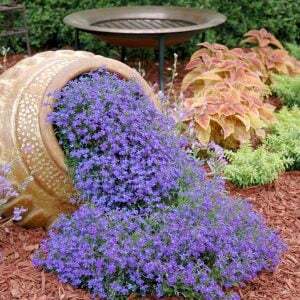 Keep in mind, these types of herb garden containers are also easy to move. ‘Brooklyn Limestone‘ created this vertical DIY herb garden, and she shows you how step by step… Perfect if you just want some kitchen herbs right off the back door! I love how she did this, and labeled with a paint pen. 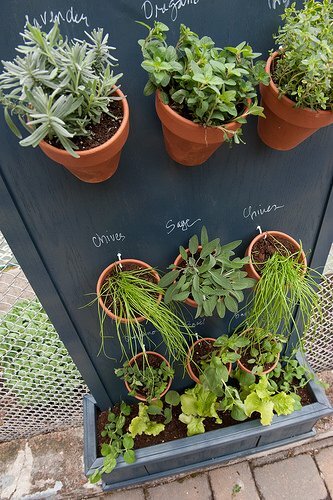 But if, and this is a big if, your herb garden will be under cover, what about using chalkboard paint? 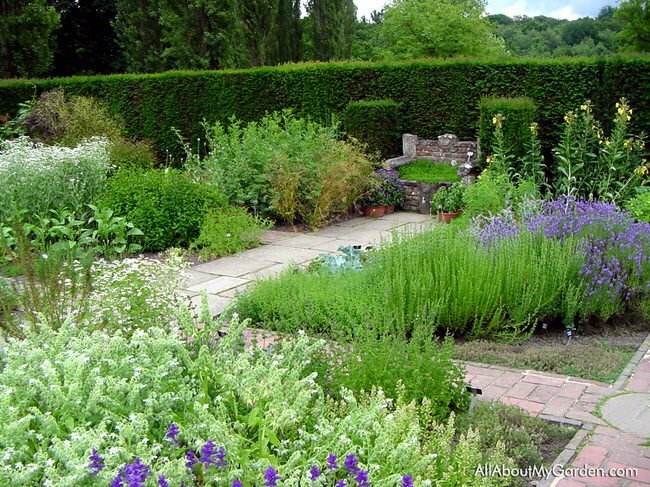 Want a neat outdoor herb garden? 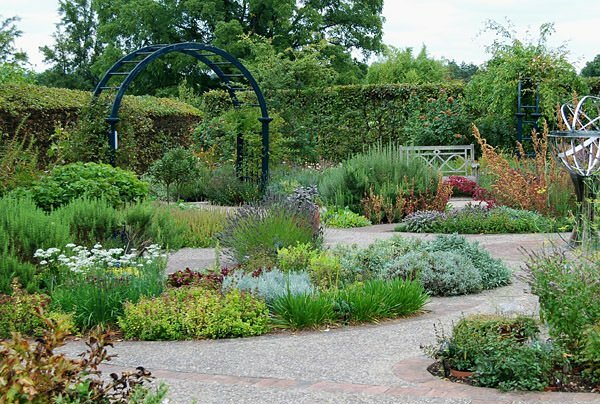 Plant herbs in pots in the ground, like they did in this garden in France, courtesy of ‘Townmouse‘. 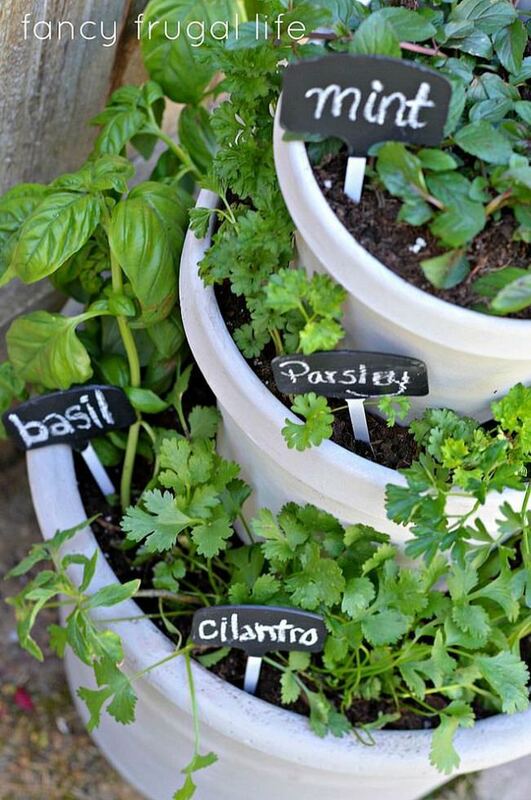 Easy idea for a quick outdoor herb garden, that doesn’t lack any charm, from ‘Precious Sister‘. 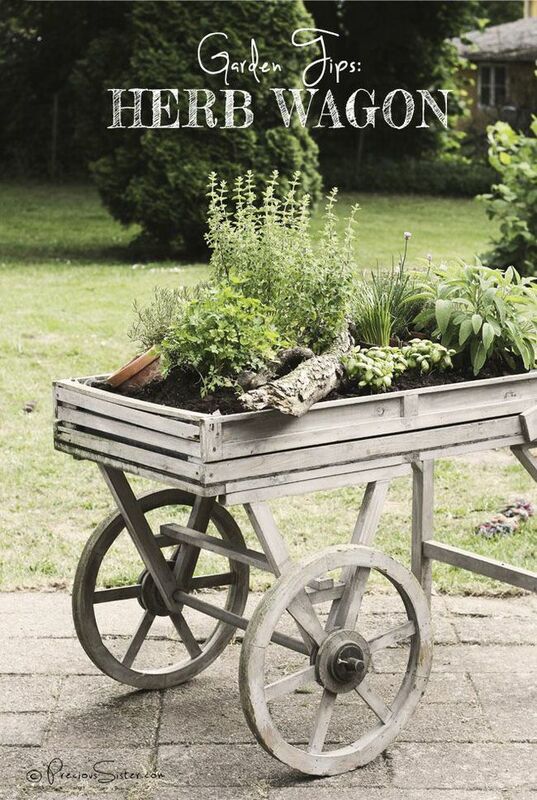 This herb wagon garden is just what we all need… seriously, does it get better than this? Also, it is raised up to make sure someone who has knee issues (me) can take care of it. Wouldn’t this be a great gift for a friend? An herb wagon??? 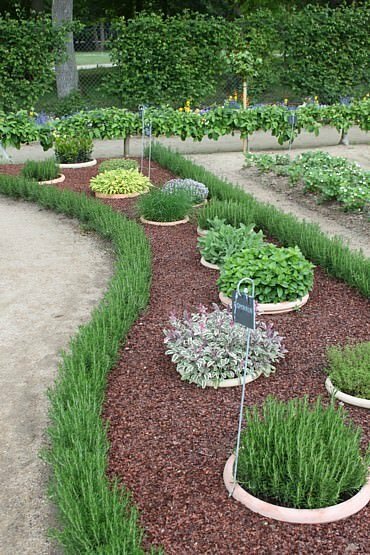 Amazing herb garden idea! 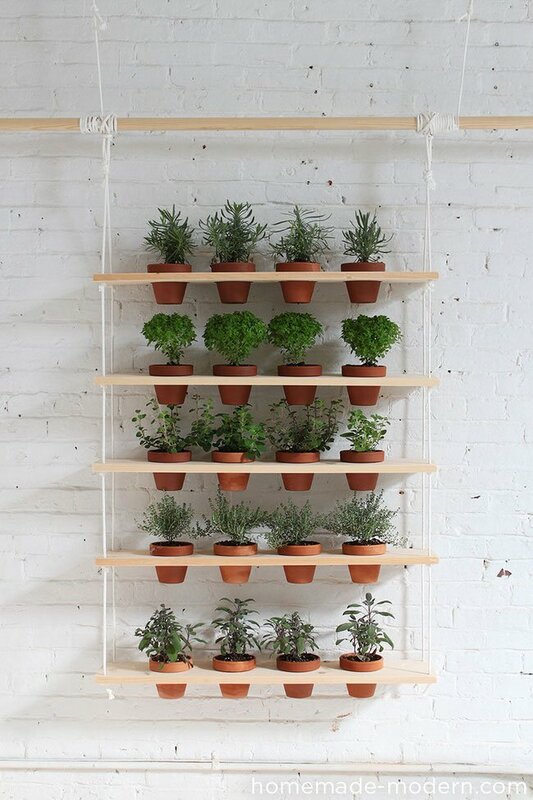 Need a DIY herb garden project, and not looking for cute, but just cool? 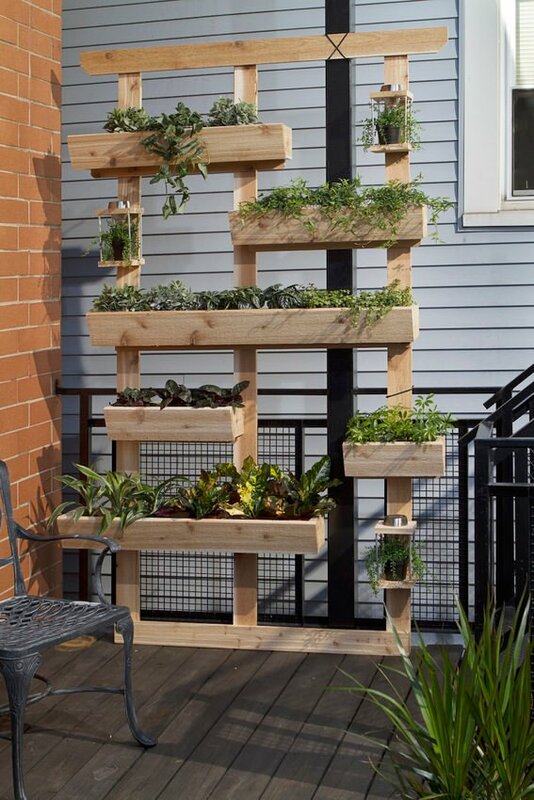 Try this DIY hanging herb garden by ‘Homemade Modern‘, made from pine boards, rope and zip ties! This DIY outdoor living wall was create by ‘Dremel Weekends’ for ‘Curbly‘, and this is clearly the way to grow outdoor herb gardens. Plenty of light gets in, easy to water, no weeding, good air circulation… win, win! 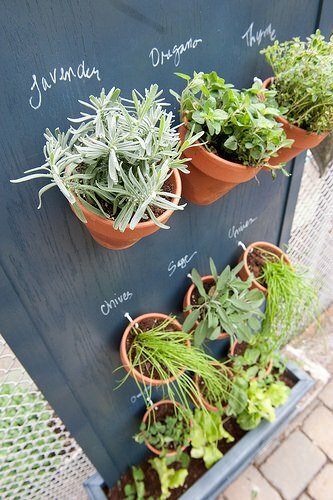 Lina at ‘Fancy Frugal Life‘ made these DIY stacked outdoor herb gardens, complete with chalkboard markers! Great for small gardens that need a space saving solution, or just because you want something with more interest. Cute! Complete tutorial with photos. This is a really creative idea… DIY herb garden in bottles! ‘11 Eureka‘ created this from mercury bottles meant to be candleholders… this is far and away a better use for them! 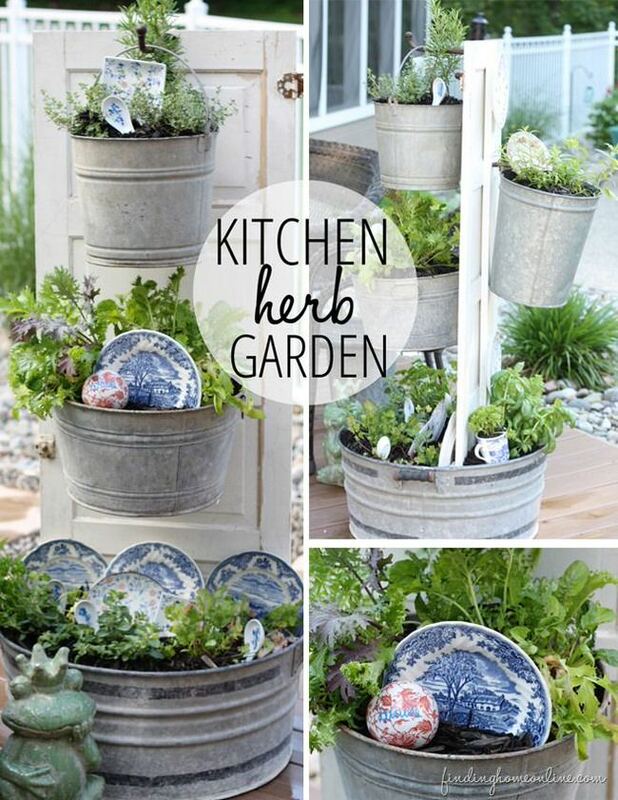 I’d love these herb garden containers hung on porches, decks and even in trees! 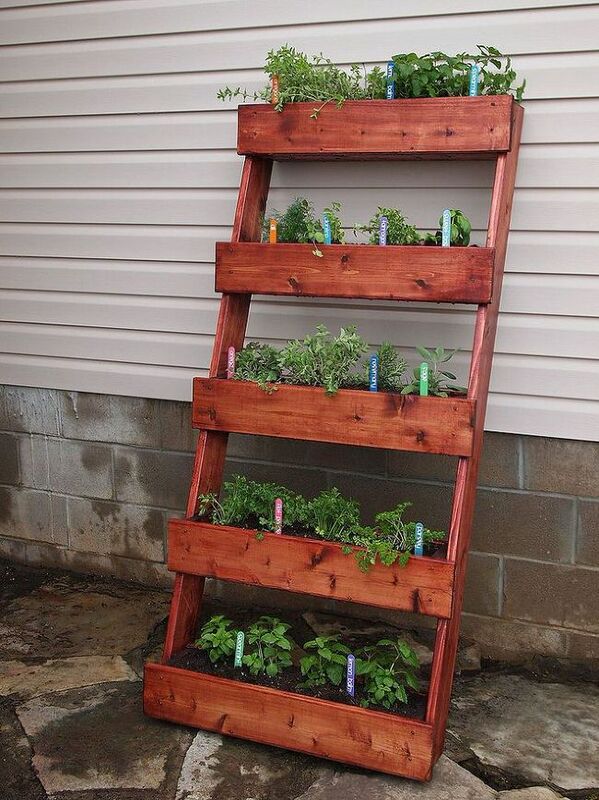 Ok, now that we have you inspired that you too, can have an outdoor herb garden… It’s time to really get inspired! Photo from ‘del Buono Gazerwirz‘. Photo by ‘Anna in Germany‘. 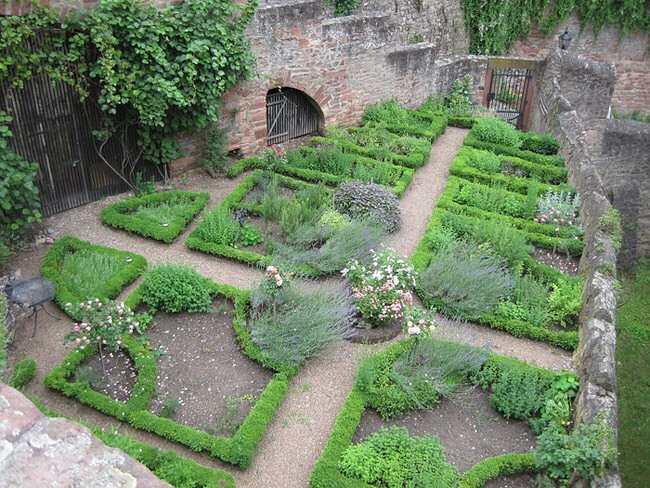 Finally we have the herb garden at Sissinghurst Castle, Just in case you want to dream. Via ‘All About my Garden‘. Hopefully you loved learning about growing herbs outdoors in our post “Outdoor Herb Gardens’! Now jump on over to our posts on How to Grow Lavender and 14 Indoor Herb Gardens! 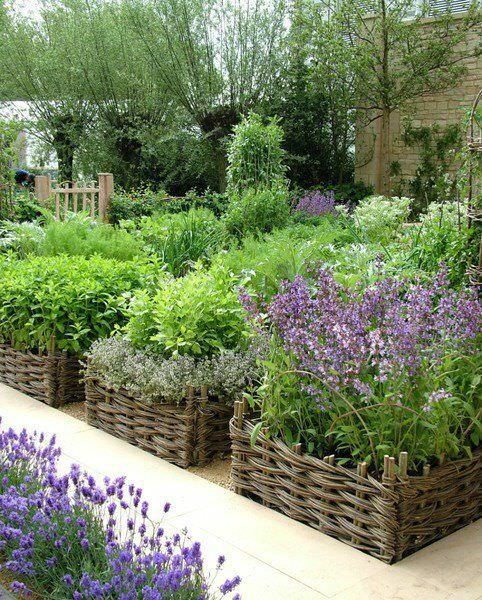 I absolutely love the herb garden in the wicker baskets; but, my concern is will those baskets hold up through the summer season – heavy rains, or hail? I would guess baskets would only stand the weather for so long… You can probably extend their life by spraying then with a sealer before using them,and don’t plant directly in them, use pots! As a person who both gardens and weaves baskets on occassion, it looks to me like the wicker work isn’t a basket, it’s used like a wall to seperate plants. If you look closely, the uprights are staked into the ground. They look to be branches that had been trimmed off of fruit trees, or vines, which means that they are not only a renewable resource, but an excellent use of what would otherwise be yard waste. Likewise, the woven material seems to be either thinner branches, vines, or carefully died basketry reed. If I’m right, it also makes it easy to replace any woven wall if damaged by weather, careless mowers, or the natural entropy of the Universe. If you’re using this for outdoor planting, I would recomend not using spray paint or sealants. Sealants and spray paints can release chemicals into your soil (and therefore your plants), they keep the wicker work from being able to biodegrade (and provide you with some added compost), and it makes the wicker more fragile, because it keeps the reed from being able to swell and contract with the environment. 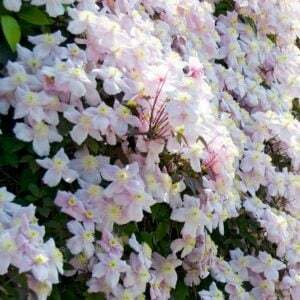 Bellas ideas, encantadoras para mi jardin. Dear. It’s very good garden design.